• Sensitive and accurate. Use as little as 10 μL samples. Linear detection range in 96-well plate: 0.02 to 1 mM sialic acid for colorimetric assays and 2 to 100 μM for fluorimetric assays. • Simple and convenient. Can detect free sialic acid by addition of a single working reagent and incubation for 60 min at room temperature or total sialic acid by pre-treating samples with a 60 min hydrolysis step. Sialic acid is a general name for nine carbon acidic sugars with N- or O-substituted derivatives. The most common member of these sugars is N-acetylneuraminic acid (NANA). Sialic acid is widely distributed throughout mammalian tissues and fluids including serum. Sialylated oligosaccharides have been shown to exhibit antiviral properties and are also known to influence blood coagulation and cholesterol levels. The Sialic acid level in body fluids is also an important marker for diagnosing cancer. Simple, direct and automation-ready procedures for measuring sialic acid concentrations find wide applications in research and drug discovery. BioAssay Systems’ sialic acid assay uses a single Working Reagent that combines NANA aldolase, pyruvate oxidase and hydrogen peroxide determination in one step. The color intensity of the reaction product at 570nm or fluorescence intensity at λex/em = 530/585nm is directly proportional to sialic acid concentration in the sample. Applications For quantitative determination of free and total sialic acid (NANA) and evaluation of drug effects on its metabolism. References Assay: Sialic Acid in human serum (Pubmed). 2. Sarangarajan, R et al. METHODS FOR TREATMENT OF A SARCOMA USING AN EPIMETABOLIC SHIFTER (COENZYME Q10). US Patent Appl. US 2011/0064747 A1. Assay: Sialic Acid in N/A lipoproteins (Pubmed). 3. Chrostek, L et al (2014). Sialic acid level reflects the disturbances of glycosylation and acute-phase reaction in rheumatic diseases. Rheumatol International. 34(3):393-9. Assay: Serum in Humans (Pubmed). 4. Ha, TK, Kim, YG, Lee, GM (2014). Effect of lithium chloride on the production and sialylation of Fc-fusion protein in Chinese hamster ovary cell culture. Appl Microbiol Biotechnol. 98(22):9239-48. Assay: Ovary Cells in Hamsters (Pubmed). 5. Ganther, M et al (2014). Partial synthesis of ganglioside and lysoganglioside lipoforms as internal standards for MS quantification. J Lipid Res. 55(12):2692-704. Assay: Brain Gangliosides in Bovines (Pubmed). 1. Cylwik B et al (2010). The changes of sialic acid concentration and content in apolipoprotein B-containing lipoproteins in the sera of alcoholics. Alcohol Alcohol. 45(5):422-6. 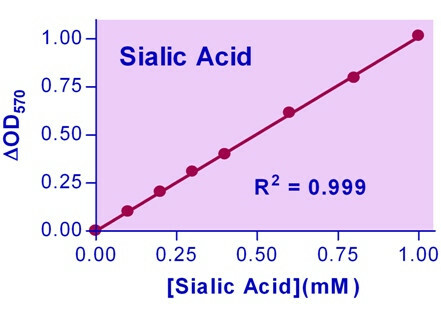 Assay: Sialic Acid in human serum (Pubmed).